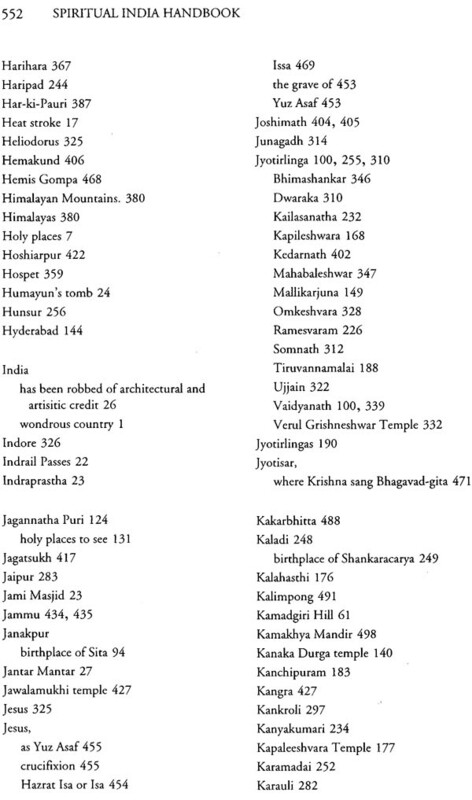 This book is for anyone who wants to know of the many holy sites that you can visit while traveling within India, how to reach them, and what is the history and significance of these most spiritual of sacred sites, temples, and festivals. 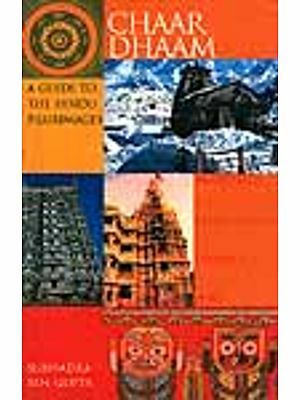 It also provides a deeper understanding of the mysteries and spiritual traditions of India. 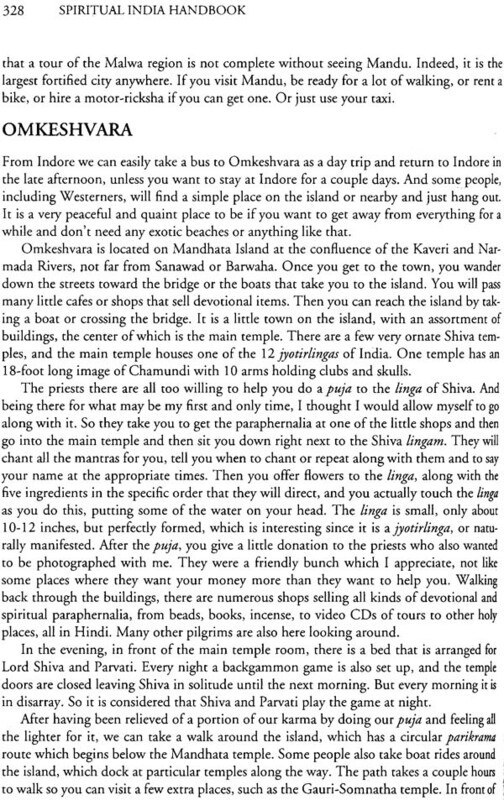 —Descriptions of the temples and their architecture, and what you will see at each place. 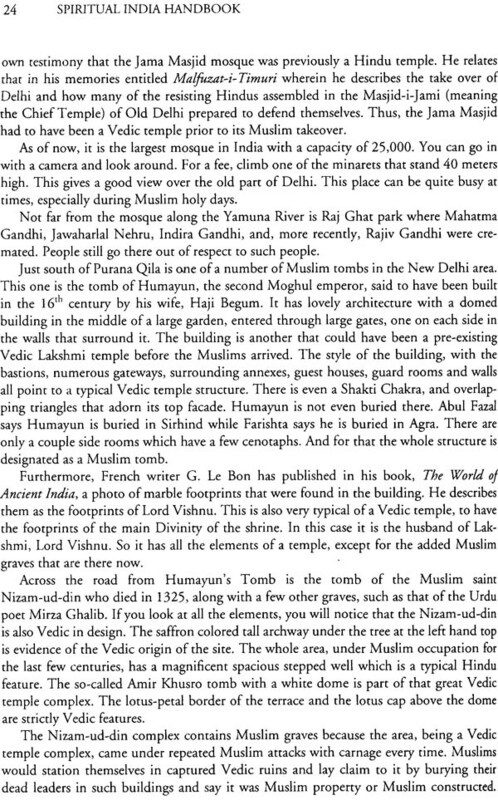 — Explanations of holy places of Hindus, Buddhists, Sikhs, Jams, Parsis, and Muslims. — The spiritual benefits a person acquires by visiting them. 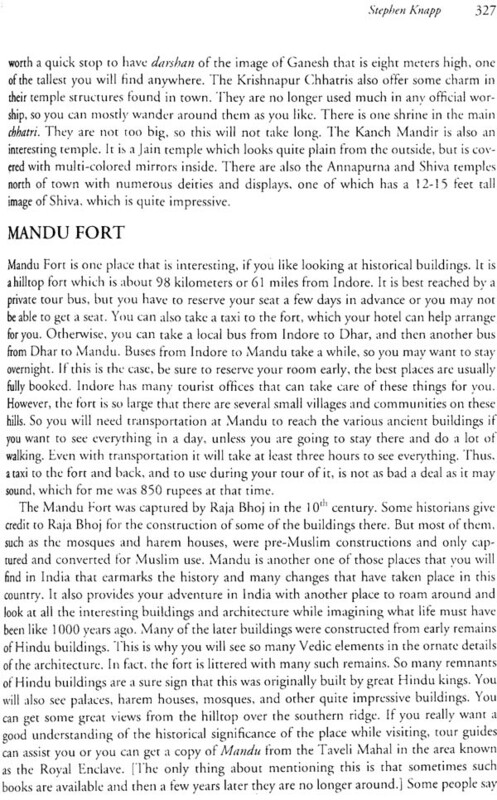 —Convenient itineraries to take to see the most of each area of India, which is divided into East, Central, South, North, West, the Far Northeast, and Nepal. — How the spiritual side of India can positively change you forever. This book goes beyond the usual descriptions of the typical tourist attractions and opens up the spiritual venue waiting to be revealed for a far deeper experience on every level. Stephen Knapp has studied the major Vedic texts of India and practice yoga and the Eastern teachings for nearly 40 years. He has traveled througbf4t India and has authored over a dozen well-received books on Vedic cultured regularly gives lectures. He is also the president of the Vedic Friends Association. Reading about Eastern philosophy is one thing, but going to Eastern lands and actually experiencing it is quite another. Seeing the local people who understand and practice this knowledge in their customary surroundings can be quite enlightening, but it can also be perplexing if you do not know what is happening or the reasons behind what people do. India, like other places in the world that have unusual mystical traditions, is a land that can be both physically and mentally demanding. 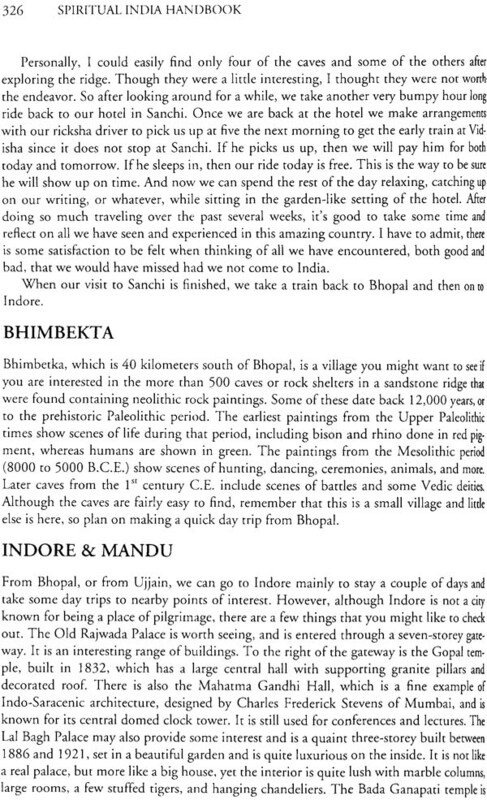 India is an exotic, beautiful, and wondrous country, depending on what aspects of it you see. Living and traveling there can be pleasant and exciting, but it is also likely to provide you with many trying situations. It can be terribly hot, dry, and dusty. Good food and water may not always be readily available. And living conditions and transportation can often leave much to be desired. But it is a total experience on every level: a testing ground that is not for everyone. It can separate the serious from the frivolous; the real truth-seekers from the superficial and worldly sight-seeing tourists. But if you want the real treasure of India, the spiritual heritage of the East, it can be found if you are determined. But you have to know where to look and how to find it. When entering India, you will most likely go through one of three places: Kolkata, Mumbai, or New Delhi. Like any big city, they can be somewhat overwhelming if you do not know where to go or how to handle the various situations that one is likely to encounter, especially in such a different culture. Some people may handle it quite easily. While others will find that the difference in lifestyle will make them ask, “Why did I ever think I wanted to come to this place?” For those, India may be a country where they stop long enough merely to see the Taj Mahal, the Jaipur Palace, and a few other places before going on to some other part of the world. Then they can say that they have been to India. But whether they actually see the real life of the people is another thing. When visiting India, you have to be willing to readjust the way you see the world. It is a country that moves slowly. For example, trains and buses are often late. So you must have patience and plenty of tolerance, otherwise you may experience much to complain about and little of the beauty and wonder that exists there. You have to look beyond the poverty, the dirt, dust, smells, and overcrowded living conditions in the cities if you expect to enter into the mysteries of India’s spiritual culture. If you are attached to your Western ways or particular standards of comfort and are not willing to adjust, then, quite honestly, you have no business going to India, not at least if you are looking for its spiritual aspects. To do that requires you to drop your guard and your pretenses, and get out amongst the people, especially the sadhus or holy men, and see them as they are, doing their regular business, visiting their temples and attending their religious festivals. Whether you understand it all or not, it is bound to awaken a part of you that you never knew existed or have rarely experienced. You may either be con- fused by it, or you may find that you are quite at home with it, feeling a spiritual tranquility, the likes of which you have hardly realized before. Attaining this spiritual serenity is a matter of evolving your consciousness. And how can your consciousness evolve if you do not decondition yourself from the habitual materialistic thought patterns in which you have grown accustomed? You must set aside your normal (or is it unmoral?) everyday ways of thinking in order to Look at things from an entirely new perspective, a different state of mind. This is what expanding your consciousness and becoming aware of higher realms of existence is all about. 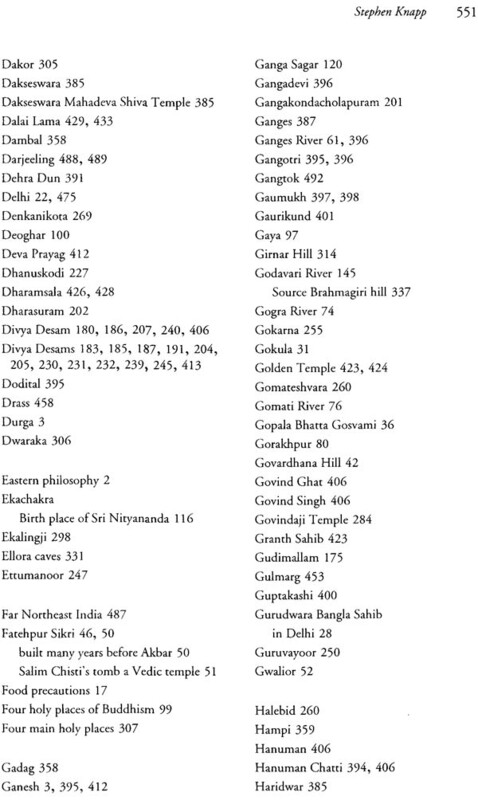 And this is the real spiritual heritage of India. It offers an individualistic process of personal transformation and development for understanding yourself, your position in the universe, and your relationship with the Supreme. However, let us remember that the goal of Eastern philosophy or yoga is not to escape or cut yourself off from the outside world, but it is to BRING IN the awareness of self, the understanding of your real identity. Upon attaining this perception, one is never shaken in any situation. Of course, this does not mean that if you go to India you will see everyone intensely absorbed in this aspect of life. Like any place else, most people will simply be engaged in the struggle to survive, work, career, or ways to make money. Nonetheless, the people of India, generally speaking, arc the most spiritually oriented people in the world, In one’s attempt to see the spiritual side of India, it is very important to know where to go and what to see in order to maximize whatever spiritual experiences you are looking for. Naturally, some places have more to offer than others, and certain towns are more sacred to specific religions or spiritual paths. There are places in India like Vrindavan, Mathura, Mayapur, Owarka, Varanasi, Pun, and others, as well as rivers like the Ganges or Yamuna, which exist and can be experienced in the normal three dimensional way. But these places are said to also exist in the spiritual realm, the higher dimension. This means that these places are where the material and spiritual energies overlap. Although the spiritual energy may pervade the universe, at such holy places or tirthas the experiences of higher dimensions are easier to attain. This is what gives these places special meaning amongst those who can perceive or know of this multidimensional aspect. This depends, however, on how receptive and elevated the person is in spiritual knowledge and awareness. For those who ate not spiritually aware, these cities and rivets will appear as no different from any other. Such people will say that the Ganges is not a holy river, that the Deities in the temples are merely stone idols, and that the sages are ordinary men. But the Vedic texts say that people with such a vision have a hellish mentality. They are forced by their own limitations 0f consciousness to be aware of nothing more than the most base level of existence and cannot perceive the higher realms of life that are all around us. For them this three dimensional material universe holds more mysteries than they can imagine, what to speak of the spiritual dimension which they cannot see at all. From the gross sensory perspective, many of the values the people of India have, as well as activities they perform in the name of spirituality, will be completely bewildering for an uncultured tourist who lacks the spiritual knowledge that India has to offer. Such people may see a variety of activities, customs, and traditions that people enthusiastically perform in their abandonment for unity between the soul and God. Yet the average tourist will have no idea of why or what is the meaning of such customs. Then, as to be expected, they will view everything as being very strange. Therefore, only for those who are spiritually elevated does the higher dimensional realm of India exist, not simply as something to observe or study, but as a reality to be experienced. For others who lack such spiritual awareness, this aspect of India will forever remain a peculiar mystery. However, with the proper knowledge they can understand what is going on and the purpose of the numerous traditions that have existed for many hundreds and thousands of years. Spiritually, the temples are like launching pads where one performs those activities that assist in reaching higher dimensions. They are the doorways to mote advanced realms and where pilgrims and devotees go to make an outward display of their devotion to their deities. Though God is within us all, and religion or yoga is very often an inward process, God can manifest externally as the deity, the arcavigraha incarnation, through which He accepts the devotee’s service while he or she is in the material realm. These devotional activities, such as simple darshan (seeing the deity and being seen by the deity), are considered purifying for one’s life and consciousness. The goal is to continue on this path until one’s thoughts are purified to the point where one sheds his or her materialistic consciousness and can enter the spiritual realm, at least by the time of death if nor before. Thus, everyone tries to visit the nearest temple a few times a day, or tries to make pilgrimages to the famous holy places. The temples usually have a main shrine with smaller temples or shrines surrounding it. These shrines may have murtis or carved images of important spiritual masters, or deities of various demigods, such as Parvati (Lord Shiva’s wife), Durga (the warrior aspect of Parvati, sometimes called Kali, Tarn, etc. 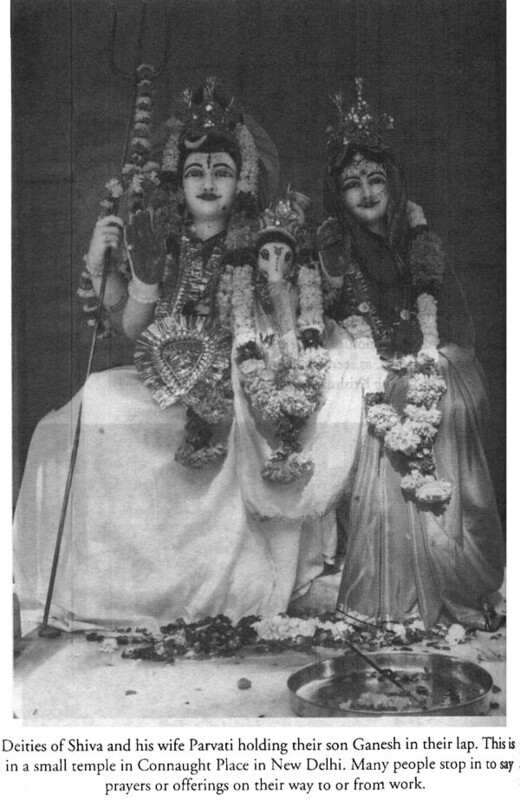 ), Sarasvati (goddess of knowledge and intelligence), Lakshmi (goddess of fortune, Lord Vishnu’s wife), Ganesh (a son of Shiva, said to destroy obstacles and offer good luck), Murugan (meaning divine child, the Tamil name for Subramaniya, another son of Shiva, especially worshiped in the South), Brahma (born from Lord Vishnu and who engineered the creation of the living beings within the universe), and Shiva (the benevolent one, part of the triad of Brahma, Vishnu, and Shiva who continually create, maintain, and destroy the universe), and other deities of the Supreme, such as Vishnu (incarnation of the Supreme appearing as the All-pervading One, the preserver or maintainer of the universe), or Krishna (the Supreme Being, source of all other incarnations, such as Rama, Vishnu, Narasimha, etc.). The temple is usually dedicated to a particular form of God or demigod which you will find on the main altar. It is explained that the deity is not a product of someone’s imagination, but is made in accordance with the ancient Vedic texts, called the Shilpasiaras, which deal with the science of iconography. Everything about the deity, such as its proportions, the postures, hand gestures. Weapons (if any), the emblems, etc., all mean something. Therefore, it is very important that every part of the deity is formed properly. The deity may also have different features which represent different aspects, abilities, powers, or pastimes. After the deity is formed, there is the elaborate installation ceremony during which the deity is installed in the temple. At this time the devotees and priests petition the personality of the demigod or Supreme Being to take up residence in the form of the deity. Only then does the deity become the arcavigraha, or a worshipable incarnation of the Supreme Being or particular demigod. It is considered that since God is the controller of both material and spiritual energies, He can turn something material into spiritual energy or vice versa. Thus, the deity, which may appear to be made of common material elements, becomes spiritual and allows us to see spiritual form with our material senses. Out of the causeless mercy of the Supreme, He agrees to reside within the form of the deity to accept the worship of His devotees. Of course, we should not think He is forced to remain there. If He is neglected or if harm is allowed to come to the deity, He may leave the form of the deity at any time. There are many stories in both traditional Vedic writings and local legends that relate how various deities have reciprocated with devotees. Such relations have taken place in dreams as well as in the awakened stare in which the deity has come to life to show Himself or Herself as He or She is, or partake in pastimes with their devotees. There are also some instances when Krishna or Shiva spontaneously manifested themselves as stone deities. Such deities are called self-manifested because they were not formed by any artist or priest. Lord Venkateshvara at Tirupati, Vishvanatha Shiva at Varanasi, and several Krishna deities at Vrindavan are a few examples of this. Of course, most Westerners of littIe faith cannot explain such occurrences, and can hardly accept that the Supreme would exhibit Himself in this way, which many would call miracles. They would rather look for some “logical” or non-mystical explanation for such things. But for the devoted and the sages who have glimpsed and understand the spiritual dimensions of existence, the deities ate a living reality. Even if one cannot accept the concept of deities, then even in the most abstract sense the images, such as in Buddhism, represent cosmic principles which affect us all. Therefore, they remain a part of the reality we experience at every moment. In this way, the temples are the places where one can see and even experience the Divine. Furthermore, many of the temples are built at locations where ancient historical or holy events involving the incarnations of God or the demigods have occurred. Such temples give evidence for the legends that are described in the Puranas which explain how the Supreme Being appeared there. 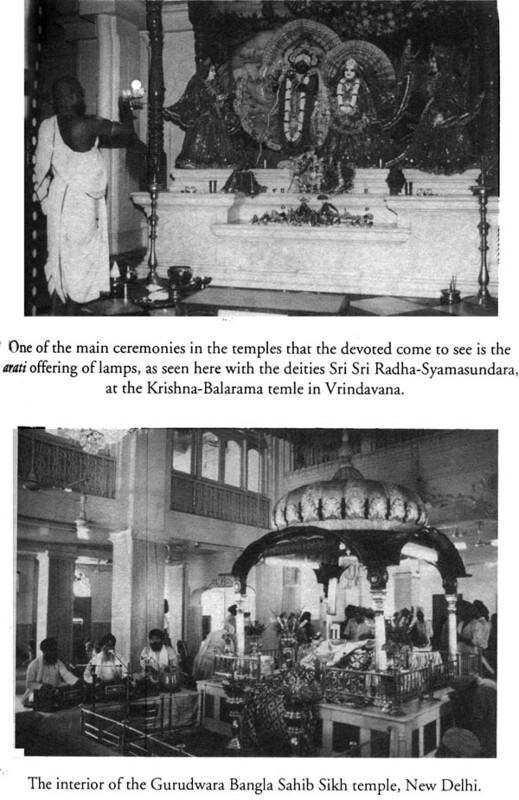 Therefore, these sites become very sacred, even spiritualized for having been the site of the pastimes of the Supreme. It is for this reason that people can acquire great spiritual merit by visiting these places. 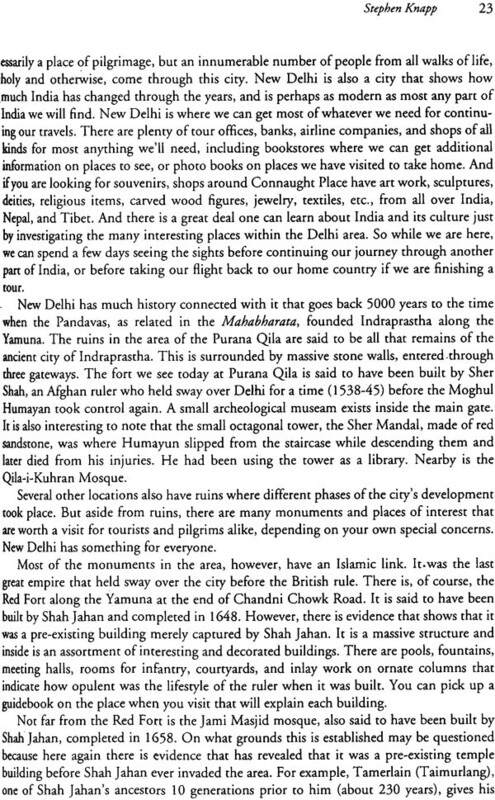 Thus, these sites become important centers on the pilgrimage routes for many of the devout. In this way, the tem pies are the most significant of the surviving monuments where religious, social, cultural, and, in many cases, political aspects of history have been preserved. 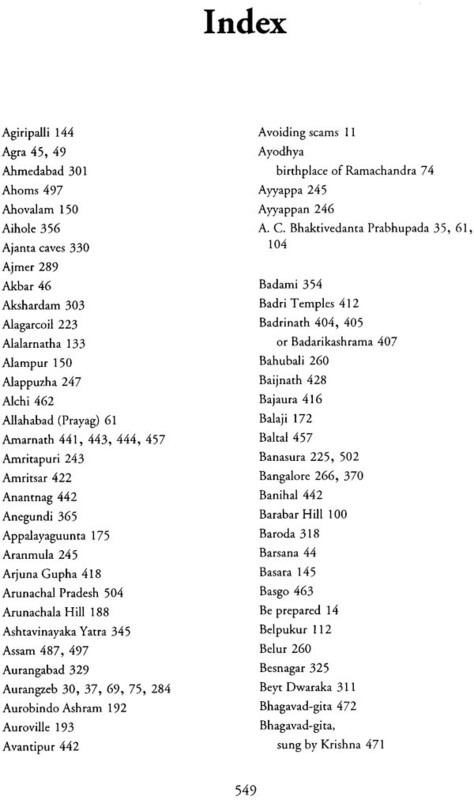 Historically, the temples were also major centers for education. The larger ones would maintain priests and students for the recitation of the Vedic and Puranic texts to the people at large. Thus, both literate or illiterate people could be provided with a cultural education. 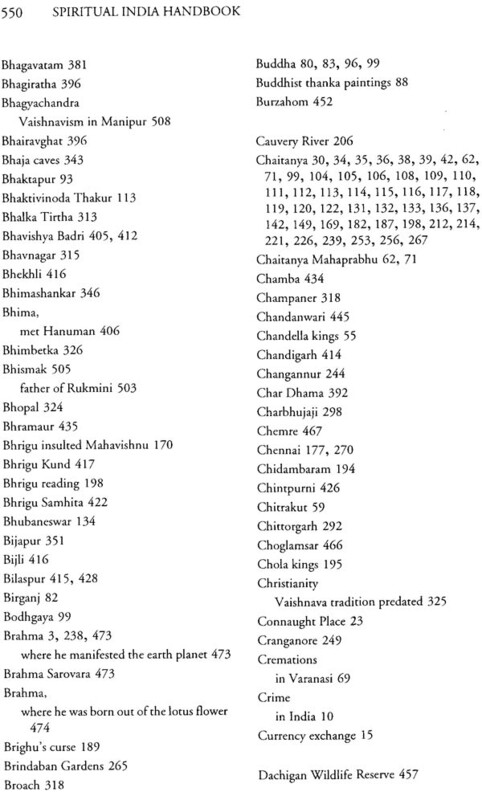 The villages, however, had schools for basic study and learning, but beyond that the temples often had libraries hill of books from all branches 0f learning and teachers who taught all these subjects. 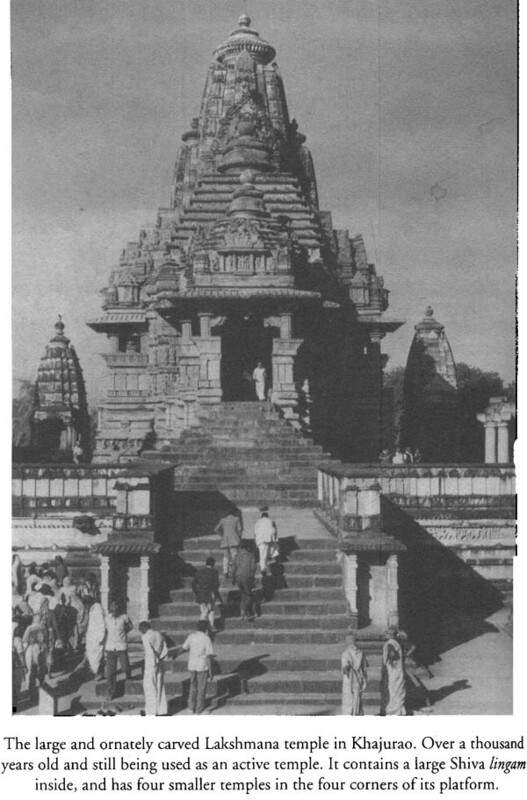 The temples also served as centers for the arts since they would employ many artists to paint scenes from the Puranic legends or carve beautiful sculptures. There were also jewelers and goldsmiths who would make articles and ornaments for the deities. Musicians and singers were also employed, and dancing girls would perform exotic dances in times of worship, especially during festivals. The larger temples had hospitals and doctors and areas for feeding and caring for the poor and destitute. In order to do all this, the temples consumed large amounts of fruits and grains. Thus, the temples were given plots of land that were used mostly by the farmers for growing food for the offerings in the temples. These offerings, however, would then be redistributed amongst the temple employees and the poor who needed food. The temples also had systems 0f banking. 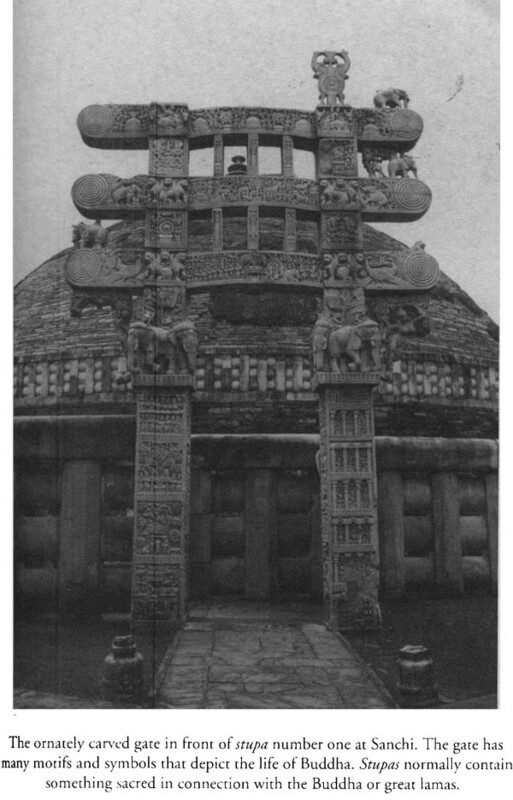 Thus, with such a variety of activity centered around them, the temples played a very important part in Indian culture, and in preserving that culture and distributing knowledge. In many cases, the temples are still the center of cultural and spiritual activity in the towns. Outlook Publishing (I) Pvt. Ltd., New Delhi.